We grew up in rural Iowa where we saw pheasants in abundance but rarely observed geese flying overhead. In truth, we are not worthy birdwatchers but we have friends in the area who are and they’ve opened our eyes to the rich bird watching opportunities that exist in our Milwaukee Wisconsin area. We know we have taken for granted the birdsong we hear in our neighborhood and the geese that fly back and forth between Lake Michigan and inland areas. We are reminded when we see our friends’ telescopes and binoculars that there are so many birds we are not seeing! For a free copy of the Great Wisconsin Birding & Nature Trail: Lake Michigan Region, call 1-800-432-8747 or order on-line at www.travelwisconsin.com These guides are also available at our bed and breakfast inn! So many of our guests enjoy Milwaukee’s cultural scene while they stay at the inn. 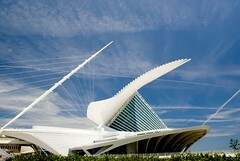 High on their list will be a visit to the Milwaukee Art Museum on the shore of Lake Michigan. This dramatic design by Santiago Calatrava is a feast for the eyes both outside and inside. Then there are the wonderful exhibits as well; this is really a must see! 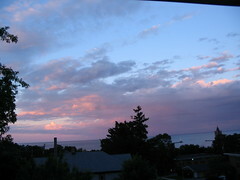 Serenity on Lake Michigan as the sun sets over Port Washington Wisconsin…..as seen from the Top of the World Suite at the Port Washington Inn. In July the colors of daylilies are like fireworks against the backdrop of the grounds…. momentary bursts of color and pattern set against the more subtle textures and varieties of groundcovers, trees, shrubs, and hostas. The grey green hardscaped surfaces lend a serene background. Sit a spell in this parklike atmostphere and enjoy the cool lake breezes. Port Washington's Harbor…something for everyone! Port’s harbor is very accessible to walkers , to serious fishermen, and to boaters! Charter fishing for trout plus coho and chinook salmon results in some very big catches as one can witness as the fishing charters return to Port Washington’s harbor. cloud formations traveling overhead are remarkable, resulting in spectacular sunrises and sunsets! Formations of geese fly in and out of the harbor, ducks paddle the breakwaters, and gulls wheel overhead. Port Washington Inn was certified by Travel Green Wisconsin in April 2007. In a certification process which evaluates the environmentally friendly practices any Wisconsin business is employing, every aspect of the inn’s operation was evaluated resulting in an overall score of 81 points (a total of 30 points is required for certification). Having eleven years of innkeeping behind us, we felt the certification was a ‘pat on the back’ for the efforts we’ve made over the years to bring the Port Washington Inn into alignment with higher standards of energy efficiency and environmental friendliness. It truly is a process and finding the workable solutions is rewarding. Read more about our environmental efforts “behind the scenes” under “the inn” menu tab of our website. Then come experience for yourselves our bed and breakfast inn. You’ll likely agree that our guests are the beneficiaries of our environmental practices!